A comprehensive overview of all the components necessary to run an effective early childhood program as a teacher, this bright new text remains keenly focused on application and skill-building, utilizing several areas of child development–aesthetic, affective, cognitive, language, physical, and social–as the basis for curriculum planning. Includes curriculum areas such as aesthetics, affective, language, physical, social, cognitive (math) and cognitive (science); chapters on child guidance; how to observe and assess children’s learning; detailed approaches to planning lessons, days and weeks; circle time activities; creating learning centers both indoors and outside; and projects and themes with sample projects and lesson plan samples throughout. The book promotes several areas of child development—aesthetic, affective, cognitive, language, physical, and social—and incorporates subject matter areas (art, math, literacy, and science) into the developmental domains rather than focusing on the subjects themselves. There are six activity types (exploratory play, guided discovery, problem-solving, discussions, demonstrations, and direct instruction) in every domain presented to the reader, as well. 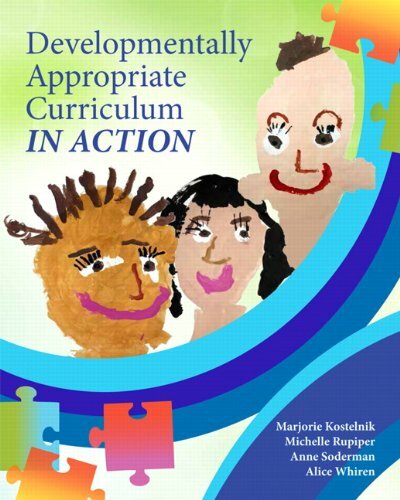 The contents of the book are all closely aligned to the current developmentally appropriate practice (DAP) guidelines. Strongly methods-based in its approach, the book also imparts the “how to” of teaching, with many developmentally appropriate examples of ways to teach children ages three to six years of age.